Fourteen children are confirmed dead and another 16 critically injured from a blast near two schools in Sana'a, Yemen this past weekend. Those numbers are likely to increase in the coming days. "The critically injured children, many of whom are fighting for their lives, are now in hospitals in Sana’a. Most are under the age of nine," says Geert Cappelaere, UNICEF Regional Director for the Middle East and North Africa. "One girl succumbed to her injuries yesterday morning." The attack shattered windows, sending shrapnel and broken glass into classrooms just before lunch. “It is hard to imagine the sheer horror that those children experienced," says Cappelaere, noting the guilt parents may feel for "having done what every parent aspires to — send their children to school." After four years of war, the attack offers further chilling proof that Yemen has become a living hell for children. From March 2015 to December 2018, 2,672 children have been killed and 4,371 injured. The numbers of children killed and seriously injured since the beginning of 2019 have already topped 400. To help families and children affected by this latest atrocity, UNICEF is providing emotional support, covering the costs of surgery and medical treatment and assisting families who must travel to sit at their children's bedsides while they receive care. Killing and maiming children are grave human rights violations. 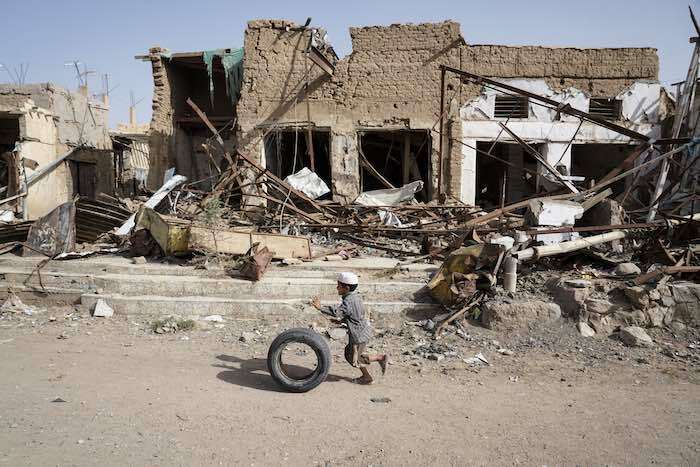 But these aren't the only threats facing Yemen’s children today. Food insecurity and preventable diseases are the biggest killers. Ten million people are a step away from famine and starvation; 7 million people are malnourished. Every 10 minutes, a child dies of a cause that could have been prevented if the nation's health care system were not crippled by war. Although health care professionals continue working valiantly across the nation, keeping disease at bay remains an unattainable goal. Cholera is starting to spread like wildfire across the country. Nearly one-third of the reported cholera cases are in children under the age of five. In a joint statement at the end of March, Cappelaere and Ahmed Al Mandhari, WHO Regional Director for the Eastern Mediterranean, said, “We fear that the number of suspected cholera cases will continue to increase with the early arrival of the rainy season and as basic services including lifesaving water systems and networks have collapsed." Cholera is particularly dangerous for young children — and life-threatening for those who are malnourished. 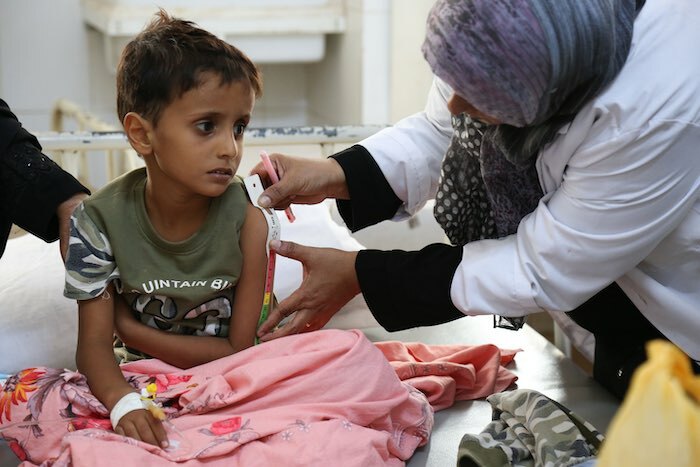 For the nearly 360,000 Yemeni children under 5 who are suffering from severe acute malnutrition today, the resurgence of the deadly disease poses grave risks. To keep them and everyone safe, UNICEF and partners are working day and night to stop cholera's spread. Water, hygiene and sanitation supplies are being mobilized, and treatment centers set up to help the sick. Rapid response teams have also been deployed to educate families about how to keep their children healthy and when to seek medical care. An immunization campaign has already reached 400,000 people with one round of the oral cholera vaccine. It is time for the war to come to an end. If not, Yemen will continue to be trapped in endless humanitarian disasters — with the most vulnerable paying the highest price. "It is time for the war to come to an end," said Cappelaere and Al Mandhari. "If not, Yemen will continue to be trapped in endless humanitarian disasters — with the most vulnerable paying the highest price." Nearly 80 percent of Yemen’s population — 24.1 million people — requires some form of humanitarian assistance and protection. Please donate today to help UNICEF provide the lifesaving assistance children and their families so desperately need. UNICEF and partners are working tirelessly in Yemen, Syria, South Sudan, Bangladesh and around the world to protect children. With a presence in 190 countries and territories, UNICEF has helped save more children's lives than any other humanitarian organization in the world.